The best day of the year to start a composting program in your home, school or workplace is April 22. This is Earth Day, when we all show our support for environmental protection. Collecting organic trash and composting it helps the environment in many ways. And it’s easy to do! When you toss an apple core into the trash, it gets mixed in with all the other trash. In a few days, you have a stinky mess in a sealed plastic bag for the trash collector to pick up. The trash is either incinerated or put into a landfill. Burning mixed trash creates toxic gasses, and the resulting ash is handled as toxic waste. Landfills produce methane, a greenhouse gas. And landfills eventually come back to haunt us. If you put that same apple core into a composting bin, something wonderful happens. Microbes, insects and fungi immediately start breaking down the material. If there are composting worms in the bin, they eat the food and excrete a dark, crumbly substance called “black gold,” a perfect fertilizer. Soon enough, the bin has plenty of finished compost to harvest. Finished compost is prized by gardeners, because it helps plants grow strong. So, with composting, you end up with all-natural, free fertilizer instead of toxic waste. The composting process is how nature handles waste. When an apple core falls on the ground, it’s eaten up and broken down by soil bacteria and other microorganisms, insects and worms. Making a composting bin is a great way to harness nature’s power to recycle nutrients. 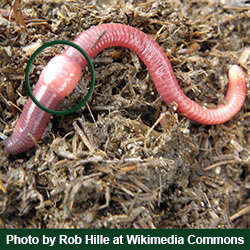 Many veteran composting fans recommend using composting worms. Worms speed up the process and reduce odors. Composting with worms can even be done indoors! Or the bin can go outside, depending on the outdoor temperature and the bin’s design and location. 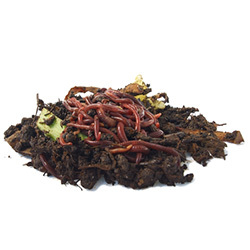 We recommend Red Worms for composting. The larger Super Reds (European Night Crawlers) can also be used for composting, but they are even better at aerating and fertilizing a garden or lawn directly (by releasing them). It’s easy to collect carrot shavings, apple cores, inedible parts of produce, uneaten and left-over vegetable and fruit parts in a composting container. The container can be on a countertop, on the floor of the cafeteria, or in the refrigerator. After a day or so, the container of scraps is emptied into a composting bin. The type of composting bin you make or buy depends on your budget, the temperatures where you live, and how much organic matter you will need to process. A larger composter is great for planting in the yard. It can handle lots of kitchen scraps and outdoor garden waste. It easily scales up for a household, school or office. These can be purchased at a garden store or built yourself. Note: Don’t plan on dumping a mountain of grass clippings in a worm bin; the composting process might get too hot. A simple composter made from a tote is budget-friendly and compact. See our tote composter video, or get the Worm Ranch Kit or a similar indoor composter. If your composter didn’t come with worms, you can order worms online. They are guaranteed to arrive alive or we will re-ship them. And if you are new to composting, check out our blog for lots of articles about setting up and maintaining a composting system. 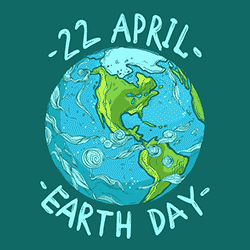 Aim to celebrate this Earth Day by starting a composting system at your home, office or school. It’s easy to get people on board. Tell them about the fallacy of throwing scraps in the trash: trash doesn’t just “go away.” Composting is aligned with the laws of nature, and it’s the only long-term solution to organic food waste. I will be sitting at a booth at our Earth Day in Idaho Falls on April 23rd. Can I have your permission to print out some of your internet pages to hand out? I plan on bringing my worm bin to demonstrate how worm bin composting works. Absolutely! Help yourself to any information that you would like to share! Have a great day!